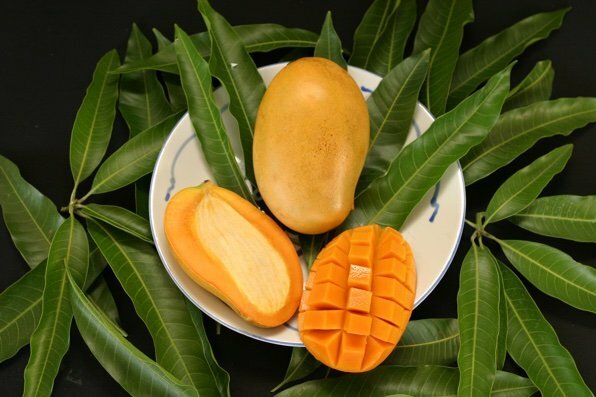 &QUOT;MALLIKA&QUOT; IS A &QUOT;CONDO MANGO&QUOT; NATIVE TO INDIA. IT HAS BECOME A FAVORITE HERE AT PIN DUE TO ITS SUPERB FLAVOR, UNPARALLELED DISEASE RESISTANCE, AND SMALL BUT EXTREMELY PRODUCTIVE HABIT. THERE IS A CATCH, HOWEVER. THE FRUIT MUST BE PICKED MATURE GREEN FOR OPTIMUM FLAVOR, AND THEY ARE TRADITIONALLY RIPENED IN CAMEL DUNG WHILE ON THE WAY TO MARKET IN INDIA. THEY CAN ALSO BE PACKED IN A CARDBOARD BOX AND KEPT AT ROOM TEMPERATURE IF CAMEL DUNG IS DIFFICULT TO COME BY IN YOUR PART OF THE WORLD. RIPENING TYPICALLY TAKES TEN TO FOURTEEN DAYS. THE SEASON IS FROM JUNE TO JULY.